Cocktails are rarely a solitary experience in my household. Many of the cocktails you find on this site are created in duplicate because they are shared among two or more people in one sitting. Which got me thinking, why don’t I have more cocktails for two on here? So, I’m going to try and have more of those around in the next few months. First up, Sangria. Except, this is way more complex of a Sangria than I thought I would be able to get out of it. This is due to an extreme case of being flustered, tired, and combatting a cold. To sum it up, I was too lazy to check in on it after the first day and just let it sit for two days in the fridge. 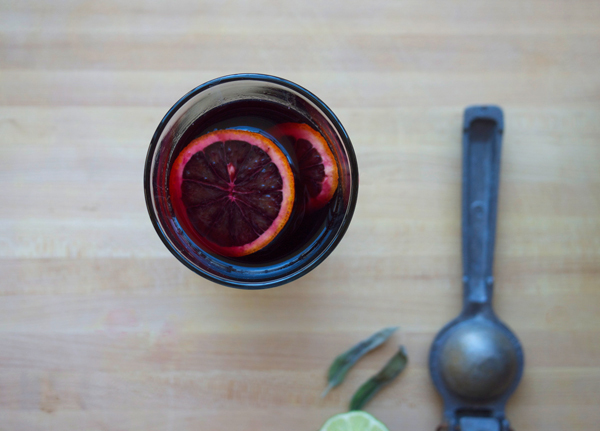 Result: a sangria for cocktail lovers. Sangria holds a special place in my memory. I remember the first time I drank it. At the office going away party that was thrown for me when I turned 21 and moved out to Los Angeles. Let’s get our story straight though; turning 21 had nothing to do with moving West. It was a passing fancy when a friend of mine decided to move out here and I decided I would too. It was a last minute decision. Rarely did I make well thought-out decisions at that age. Anyway, since there was a table of us, and technically, we were at lunch and people would be returning to the office, a pitcher of Sangria was ordered. At 21 this seemed exotic and fancy, the same way that seeing someone bring out a flaming bowl of liquor at a Chinese restaurant was exotic 10 years prior. I don’t remember how it tasted, only that it was red Sangria. Since then, I’ve been spectacularly disappointed by this drink many a time. But now something in me wanted to make this again, and make it good. Thankfully procrastination made this work in my favor. Burnt sage? YES. Just lightly torch the edges, don’t try and burn up the whole leaf. If you find you’ve charred it too much, just break that part off. This was also an excuse to use more of the black pepper syrup I have stored up in the fridge, it’s really much more versatile than I thought and adds a peppery bite to the syrupy blackberries and wine. 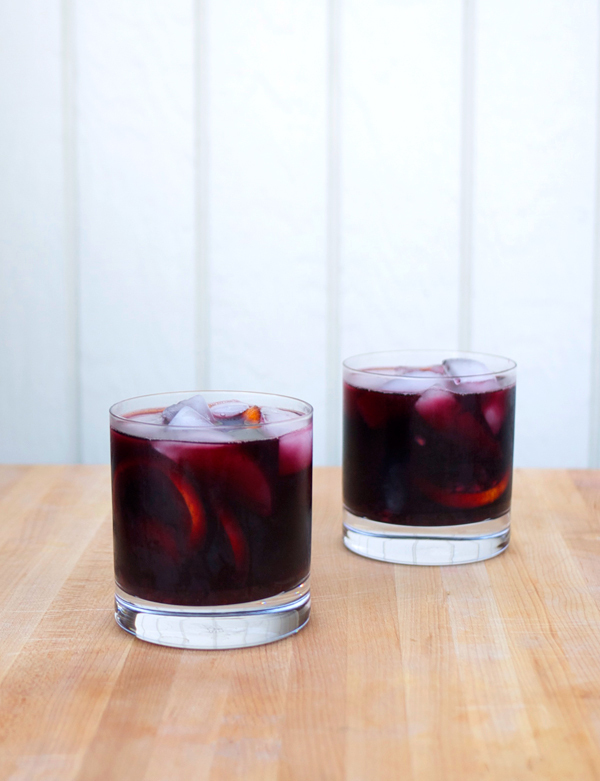 This drink is for two but can easily be adapted into a larger batch. If you have a third of a bottle laying around it’s a good way to use that up. Burn the edges of the sage leaves and let cool for a few seconds. 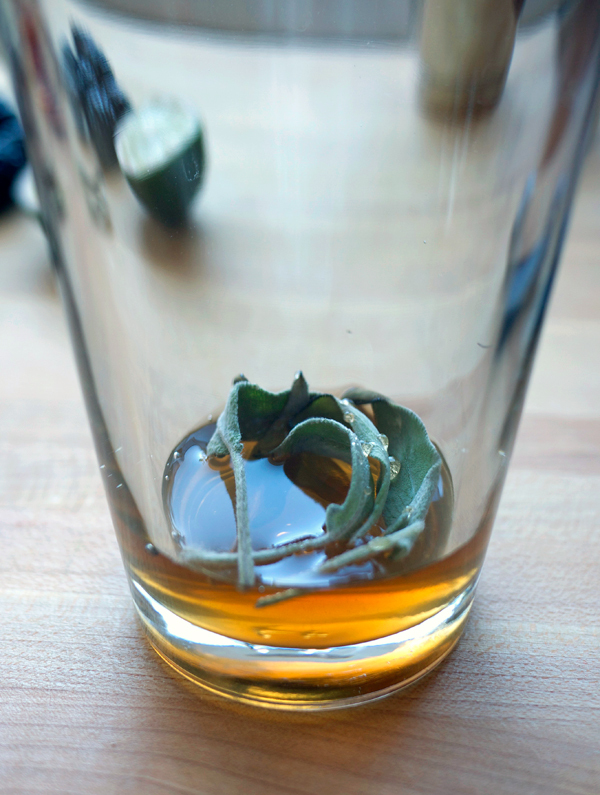 Add the leaves to the bottom of a mixing glass, add syrup and lime juice. Lightly muddle. 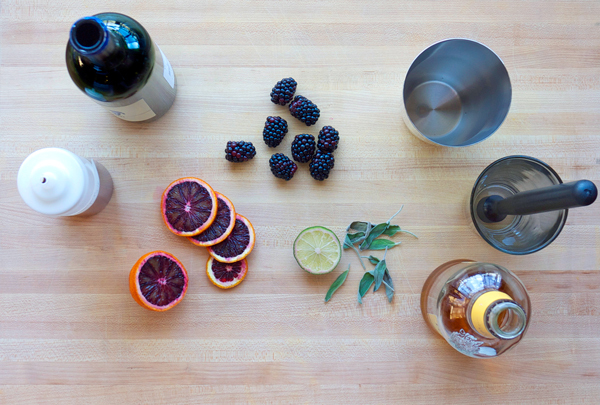 Add blackberries and crush, leaving some pieces more intact than others. Pour in wine and whiskey, add orange slices, stir to combine and cover (I used the other half of the Boston Strainer for a cover). Let sit for two days refrigerated to steep. After two days, stir gently. Fill two rocks glasses with ice cubes. Carefully pour the contents of the mixing glass between the two glasses. Don’t be afraid of the overpowering smell of whiskey you will have when you first make this. It needs to sit and steep. What you get at the end of two days is a sweet and sharp elixir. On the nose are orange and berry followed by more berry on the palate with subtle layers of tart and pepper with an earthy undertone. It’s rich, which is the one characteristic that I find lacking in most Sangrias. There is a heavier body that the whiskey contributes to overall making this seem almost more like a rather large cocktail than just a ‘wine’ drink. Now I somehow need to do this with a white wine. Wish me luck. Man, that 3rd paragraph was like reading my own memoirs. Have you been reading my diary?! Minus the whole moving bit. I may have to make this one before that tasty looking Aviation you posted, since the thought of all these ingredients sounds pretty damn rad. I was also thinking of making white wine sangria since I’ve never made it before! Raul- Try it with Lillet blanc. It would be fantastic. You know, I always wondered what sangria would taste like with lillet rose instead of the petit sirah / cab i tend to use. Oh man, and just in time for spring too. I really do enjoy sangria, especially when I know I’m having dinner guests. I’ve been working on a dry french rose sangria for awhile now.